Anyone who plays an amplified acoustic guitar on stage knows what a challenge it is to get a sound that’s as inspiring as playing the instrument acoustically. The BOSS AD-10 is your solution to this age-old problem, offering advanced sound tools that enable you to achieve rich, natural acoustic tones every time you perform. At its core, the AD-10 is a fully featured, dual-channel acoustic preamp/DI pedal with premium audio quality, deep sound-shaping options and flexible connectivity. On top of that, ambience, chorus, and delay effects are built in, eliminating the need to carry external sound processing. Because of their highly resonant construction, acoustic guitars are prone to problems with low-frequency feedback in stage situations. There are many variables that factor into the severity of feedback issues, including the instrument type, the pickup system, the location of the instrument relative to the speakers, and more. The advanced processing engine in the AD-10 goes well beyond the capabilities other preamps, providing multiple levels of feedback protection that are engineered to produce maximum results with little-to-no tone coloration. On the rear panel of the AD-10, stereo XLR jacks provide a DI feed to the front of house, while stereo 1/4-inch jacks allow you to connect to your stage amp setup or headphones for monitoring. From the AD-10’s panel, you can choose to send signals to the outputs with or without effects, or assign input channels one and two to independent outputs. There’s also an effects loop for patching in external effects, and a jack for connecting up to two footswitches or an expression pedal for controlling looper functions, volume, tap tempo, anti-feedback scan, and more. 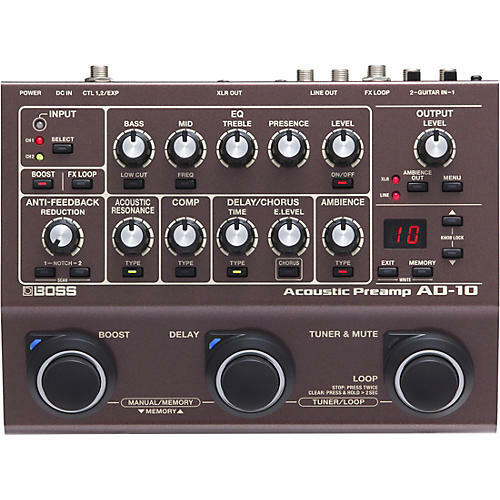 In addition, the AD-10 functions as a two-in/two-out USB audio interface, enabling you to record tracks to a DAW and play computer music through the AD-10’s audio outputs.